The Prince Albert Historical Society is grateful to Lenore and Herb Andrews for providing the resources to publish our collection on the web. Prince Albert is celebrating its 150th Anniversary since Rev. James Nisbet founded the settlement. However, their land was occupied by Aboriginal people for the last 10,000 years. One of our volunteers will be happy to make a presentation about Prince Albert's history to your group. Learn about the history of downtown Prince Albert and sample snacks from local restaurants during this 1.5 hour tour. The tour will begin at the front doors of the Historical Museum. Applications are now being accepted for Museum Interpreters at the Prince Albert Historical Society. 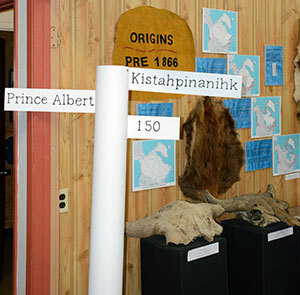 The Society operates the four Prince Albert Museums; Historical Museum, John and Olive Diefenbaker Museum, Rotary Museum of Police and Corrections and the Evolution of Education Museum and the Museums will be open to the public from May 21 to August 30, 2019. Successful applicants will be responsible for the summer operations of the museums and research projects that are requested by the public. The applicants will work with both the archival material in the Bill Smiley Archives and artefacts held by the Society. Have public speaking experience and working with the public. Be reliable, friendly and outgoing. 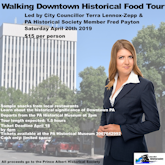 Qualified individuals are invited to submit a resume to the PA Historical Society, Attn: Michelle Taylor by Friday, April 12th, 2019. Only those individuals chosen for an interview will be contacted. The following PDF files provide more information on this summer job. The Historical Society would like to thank the Government of Canada, Museums Assistance Program for the grant of $25,000. This grant helped to purchase storage systems for our archival and artefact collection as well as a display case for the Indigenous dugout canoe. Watch for pictures of the before and after! The museums have closed for the summer and winter hours are in effect. Office hours at the Historical Museum are Monday to Friday from 9am to 4pm. The Police & Corrections, Evolution of Education, and Diefenbaker House museum locations are available by appointment. Call 306 764-2992 during office hours. Effective February 13, 2018, the PA Historical Society has instituted a new fee structure. Below are the new addmission fees. For other fees, please contact the museum directly. Are you looking for something new to do? 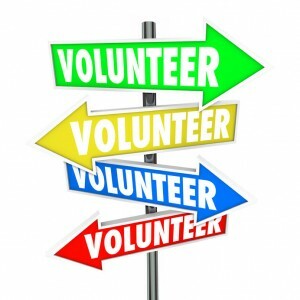 The Historical Society is looking for new members/volunteers. Contact the Historical Society office if you are interested in local history, using your creative side to plan displays and exhibits, or interested in adding your expertise to the Society (Human Resources, Governance, IT/Social Media). We look forward to hearing from you!